Two weeks ago, I posted an article about Real Buildings that Inspired Disney-MGM Studios. I held back two landmarks for todays article... landmarks that are so iconic that each inspired three theme park replicas. 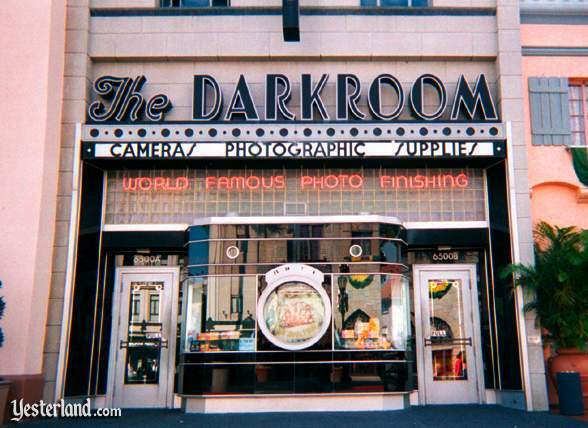 Ever since Disney-MGM Studios opened on May 1, 1989, guests heading up Hollywood Boulevard could stop at The Darkroom, presented by Kodak, for film, camera rentals, camera repair service, accessories, and photo processing. The Darkroom is still there, only today its services have expanded to reflect the popularity of digital photography. The front façade is a giant camera—an old-fashioned camera reminiscent of an Argus 35mm camera from the 1930s. Theres a term for this kind of architecture; its called programmatic architecture, structures that look like objects. Guests at Walt Disney Studios Paris pass a very similar giant camera as they enter the park through Studio 1, the soundstage thats supposed to look like a movie set of a nighttime Hollywood street scene. Shutterbugs looks a lot like The Darkroom. It even says “Cameras, Photographic Supplies” below the main sign—just like The Darkroom on the other side of the Atlantic. 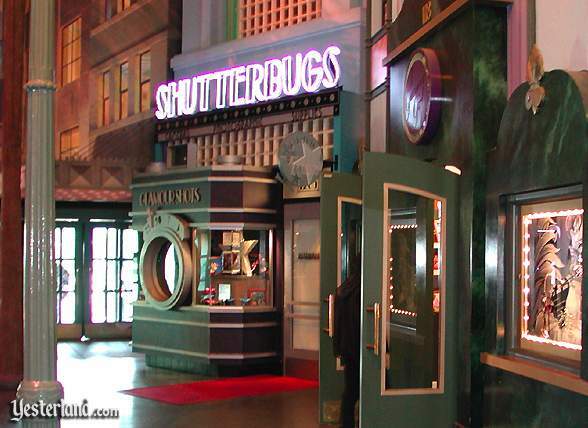 At Shutterbugs, guests are photographed against green backdrops which become Disney scenes when the photos are printed. Okay, two Disney parks have stores with similar giant cameras on their façades. So what? There are plenty of other cloned features at the eleven Disney theme parks. But theres also a giant camera at Universal Studios Orlando, and its very similar to those at the two Disney studio parks. The one at Universal is even called The Darkroom. Once again, it says “Cameras, Photographic Supplies” below the main sign. By now youve guessed (or you already knew) that there was a real store that inspired the theme park versions. And the Universal Creative folks who designed Universal Studios Florida were just as inspired by it as the Walt Disney Imagineers who designed Disneys movie studio-themed parks in Florida and France. Engineering Record collection at the Library of Congress American Memory website. 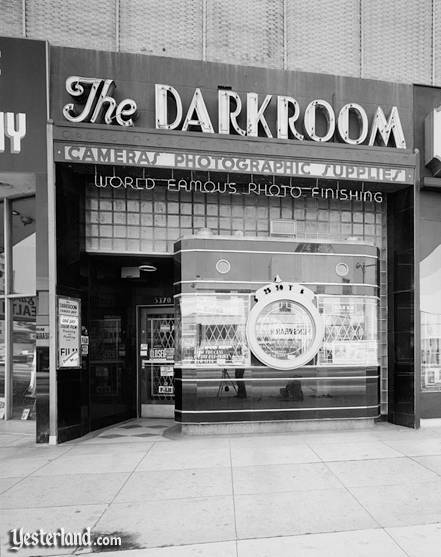 The Darkroom was a real camera store on the Miracle Mile at 5370 Wilshire Boulevard, Los Angeles. It opened in 1938 (or 1935 or 1937, depending on which book or website you want to believe). The 9-foot-tall camera was made of black vitrolite (an opaque pigmented glass), with clear glass as display windows. The round window in the position of the camera lens echoes the use of round porthole-style windows in other Streamline Moderne buildings of 1930s. It was an eye-catching way to call attention to a camera store—and quite appropriate in Southern California where a hotdog stand can look like a hot dog and a doughnut store can be topped by an immense doughnut. 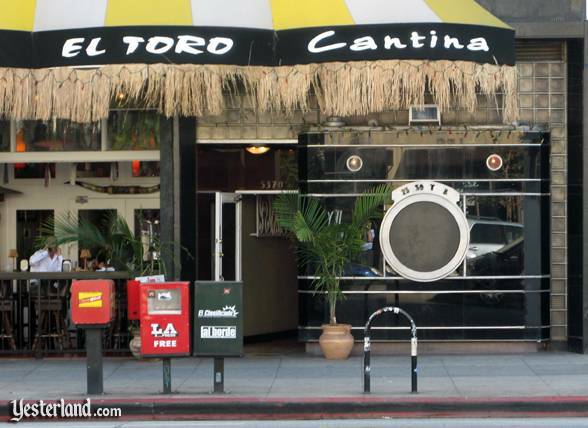 El Toro Cantina Tapas & Tequila Bar is probably the only restaurant in the world with a 9-foot-tall, 1930s-era camera facing the street. Yep. When The Darkroom ceased being a camera store, it became a restaurant. Not only is the camera still there, so is the glass block wall that surrounds it—but you have to look more closely because the thatch hides much of the glass block wall. Before becoming El Toro Cantina, the former camera store had been at least two other restaurants: Sher-E Punjab Cuisine and La Boca del Conga Room. At Disneys Studios park in Florida, the giant camera is grafted onto a building inspired by a 7290 Beverly Boulevard, which now home to an ice cream and latte restaurant, MILK. If a camera store can look like a camera, a restaurant can be named after a hat—and even look like a hat. 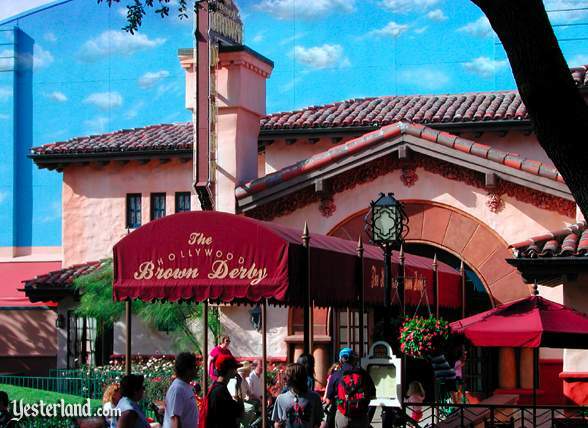 The Hollywood Brown Derby is one of the few Walt Disney World Signature Restaurants (the top tier of WDW restaurants) to be inside a theme park. Its not an identical copy of the Brown Derby that served Hollywood studio executives, movie stars and wide-eyed tourists for several decades—it had to be larger. However, the Walt Disney Imagineers carefully captured the style of the Hollywood landmark, inside and outside. Disneys Hollywood Brown Derby is an excellent restaurant which even serves two legendary dishes that were invented at the real Brown Derby—Famous Brown Derby Cobb Salad (finely chopped greens, turkey breast, egg, bacon, tomatoes, crumbled bleu cheese, avocado, chives, with Cobb dressing) and Grapefruit Cake (layers of yellow cake with fresh grapefruit cream cheese icing). 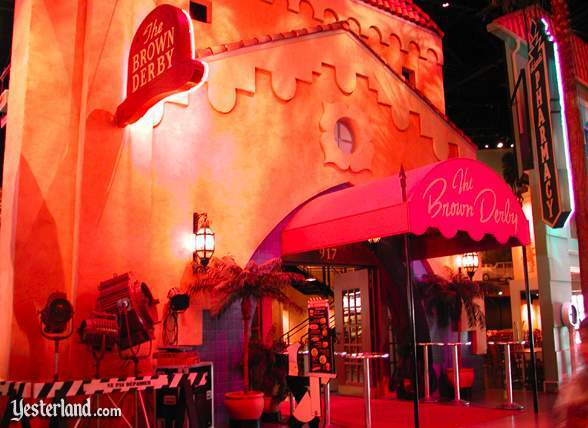 At Walt Disney Studios Paris, the Brown Derby is part of a counter-service eatery, Restaurant en Coulisse (which means “restaurant among the stage sets”), hosted by Coca Cola. Its not really a building; its just a false front on a re-created sound stage. Youre supposed to feel as though you eating on a movie set—the same Hollywood movie set thats home to Shutterbugs. After you pick up a quick salad, burger, pizza, lasagne, ice cream, or other dessert, you can eat while standing at a small table at the entrance to The Brown Derby. There are also other places to stand or sit down. In the Hollywood section of Universal Studios Orlando, the Brown Derby is not a restaurant. Its a hat shop that looks like a hat. If you think about it, that actually makes more sense than a restaurant that looks like a hat. Of course, Disneys two Brown Derby restaurants dont look hats. Whys that? The answer is that Disney and Universal were inspired by two different Brown Derby restaurants. Disneys Brown Derby in Florida is proud of its heritage. 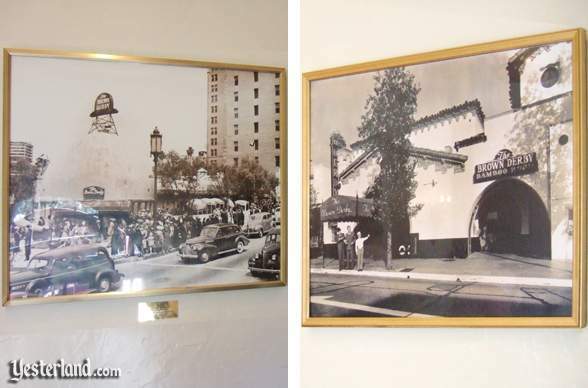 Numerous historic photos of the actual Brown Derby restaurants and their celebrity dining guests grace the walls. So its a good place to compare the different Brown Derby restaurants. Both of Disneys Brown Derby restaurants are based on the Hollywood Brown Derby at 1628 Vine Street in Hollywood. This famous restaurant, designed in the Spanish Colonial Revival style, served guests from 1929 until 1985. After working all day at nearby film studios, movie stars unwound at the Hollywood Brown Derbys booths, while caricatures of their colleagues hung on the walls. This is where Clark Gable proposed to Carol Lombard in 1939. After the restaurants closed in 1985, fires in 1987 and 1990 damaged the building. It was demolished in 1994. A chic 305-room W Hotel opened at the site on January 28, 2010. Photo by Chalmers Butterfield. This is a file from Wikimedia Commons. Universals Brown Derby Hat Shop was based on the original Brown Derby on Wilshire Boulevard in Los Angles. From 1926 until the mid-1980s, this Brown Derby was famous for its unique architecture. At what other restaurant could you dine in a 28-foot-diameter bowler hat? 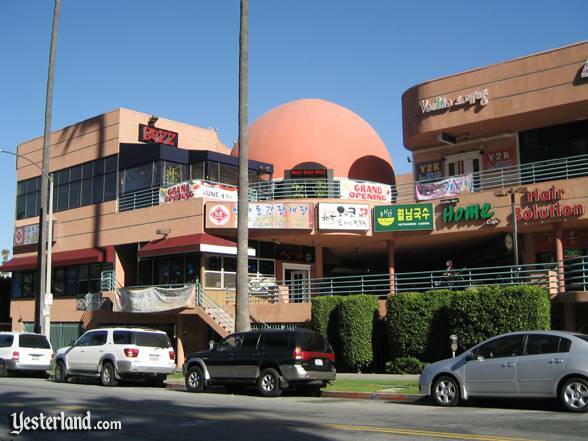 Its original location was 3427 Wilshire Boulevard. In 1937 the Brown Derby moved one block away to 3347 Wilshire Boulevard where the hat was one corner of a larger restaurant building. Although there were four main Brown Derby restaurants (Wilshire, Hollywood, Beverly Hills, and Los Feliz) and several short-lived branches at one time or another in Southern California, the original restaurant on Wilshire was the only one that looked like a hat. 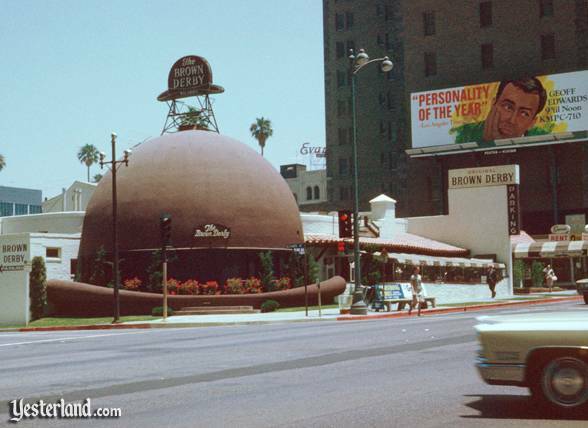 Although the Wilshire Brown Derby is long-gone, the shell of the hat still exists. It sits on the third floor of a mini-mall called Brown Derby Plaza that replaced the restaurant. Unfortunately, its not recognizable as the famous restaurant it once was. 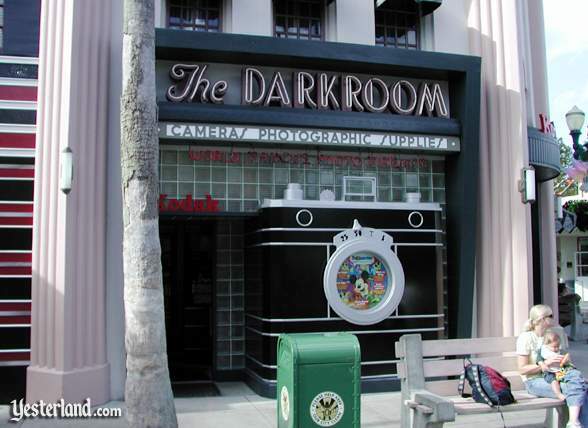 Photo of The Darkroom at Disney-MGM Studios: 2006 by Werner Weiss. Photo of Shutterbugs at Disney Studios Paris: 2005 by Werner Weiss. Photo of The Darkroom at Universal Studios Orlando: 2000 by Werner Weiss. Historic black & white photo of The Darkroom: circa 1972-77 by Marvin Rand, (with permission). Photo of The former Darkroom on Wilshire Blvd., Los Angeles: 2007 by Werner Weiss. Photo of The Brown Derby at Disney-MGM Studios: 2006 by Werner Weiss. Photo of The Brown Derby at Disney Studios Paris: 2005 by Werner Weiss. 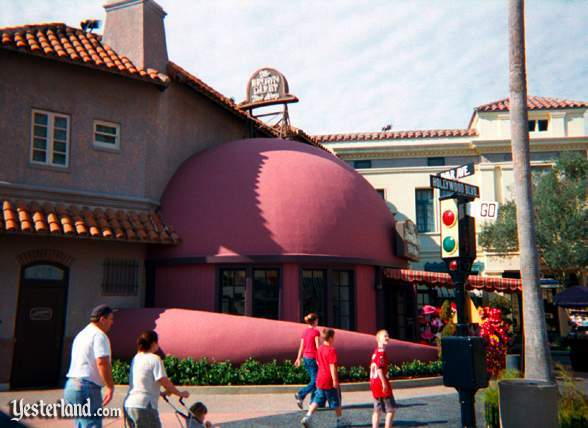 Photo of The Brown Derby at Universal Studios Orlando: 2000 by Werner Weiss. Photo of pictures on the wall at The Brown Derby at Disney-MGM Studios: 2007 by Allen Huffman. Photo of The Brown Derby on Wilshire Blvd. : Photo by Chalmers Butterfield, circa 1970. Photo of Brown Derby Plaza: 2007 by Charles Wang.